Your highlight shouldn’t be the only thing glowing the day of your celebration! Make sure to add on an extra bling with gorgeous Quinceanera accessories that will finalize your look. It is a good thing that there’s always room for accessories because you’re sure to need plenty and we happen to have the perfect pieces you will need. They aren’t your ordinary Quince pieces, we recently came across the fabulous work of art, talented Oscar Felix, has created. We assure you, you won’t want to take your eyes off these dazzling crowns & tiaras, headpieces, and bouquets. Trust us when we say details really do matter and if you so happen to love dramatic looks, these crowns and tiaras are for you! Whether you want a majestic crown as big as Miss Universe or a petite crown as precious as Meghan Markle’s wedding look, we have them all! Click here to check out style by Oscar Felix! Planning on having an elegant up-do or half up-do? The following headpieces are calling your name. 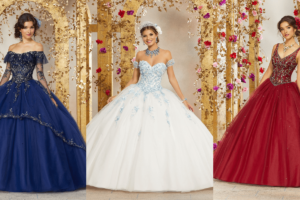 Customized accordingly with your Quince look, you’re sure to look like an absolute princess! Click here to check tiaras by Oscar Felix! You can’t forget about one of the most traditional components to a Quinceaneras look, a bouquet is always needed, and the best part is, you can have it custom-made to match your Quince dress and/or accessories! Click here to check out bouquets by Oscar Felix!